logo done by zuus :: vote for the logos you like and be a lamah ! Nice and compact. I love the theme. Good scenes all around, if some of them I've seen too many times on C64 always. Thankfully the fresh and interesting stuff manages to push this to the top. Great music and graphics too. Awesome music, great style, nice effects. Completely enjoyed it! Soom cool effects, plasma in the windscreen. I don´t know...somehow this wasn´t to my taste. It´s a nice Demo for sure, worth my thumb, but sth didn´t work with me here i guess. rulez added on the 2017-02-12 13:37:48 by ɧ4ɾɗվ. Well executed crowd-pleaser, even if the 1980s theme is a bit yawn-inducing by now. 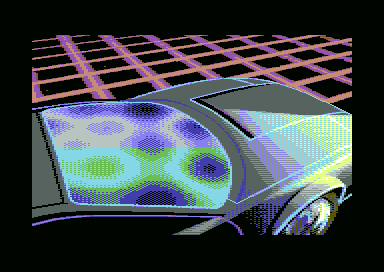 I'll be honest, I feel the music missed the synthwave mark (perhaps deliberately, I don't know) and was paradoxically "too" retro, so the end result felt like a relatively common C64 demo with a visual theme tacked on. If the music would've been more deliberately late-80s and perhaps a bit thicker, more darker, I think it would've served the experience better. In general I feel that jumping on the synthwave bandwagon on the C64 might be too contrived - taking something that was updating an old aesthetic and retro-ifying it again, "demaking a remake" in a sense, might be too many layers for the essence not to be lost. rulez added on the 2017-02-12 15:33:47 by w00t! enjoyed it a lot on the stream, need to watch on the real thing. I loved the twister. Rest was... nice, I guess, but nothing memorable for me. Sort of what gargaj said, but this is just too fun not to thumb up! What gargaj said, but still the thumb because after all it's still a coherent and relatively entertaining c64 demo. There's really nothing here that particularly struck a chord with me but at the same time I can't find a fault in it. Very good and consistent visuals, nice flow, design and attention to details. The music is nice, but some cool synth wave track would fit here much better. I don't really understand the criticism of the 1980s theme. Firstly, why not. Secondly, this is the best impersonation of a Hackers (the demogroup) demo on a limited hardware thus far, which must be worth something. Thirdly, saying that an oldschool demo is not fashionable enough is, like, wow. Now, I feel that it was a bit disjoint and I also feel that some of the scenes were way too demosceneish (and old-fashioned) and therefore not fitting. However, the flashing neon sign at the beginning and also the glitches over the static of a view of a Tron-like city were way, way unexpectedly fantastic and even if all the rest was twice as bad I would have given this the thumb up. Smooth ride! I especially dig the 'shiny scaling sinus scroller with dither shading' (duh). I find the theme kind of ironic: it's got the 2010s interpretation of 80's retro visuals on a computer that was made in 1982. That didn't retract my enjoyment from the demo at all though: it's pure quality all the way through even if the theme isn't my 100% cup of tea. Really pro design all the way - ilesj & Twoflower delivers! Great music as well by Flex = WIN! Nice and consistent style! I really liked the black-and-white twister and the dithered colram-scroller! very solid ride back in time, nice work. I will give it a thumb, good release but it should have gotten second place in my eyes! Cool effects, graphics, sound - surely rulez, good stuff! Not fav music but great demo! Very nice! The outrun style is very well executed. Love the endscroll music. the music is fulla awesomeness! great city, nice graphics and effects all over. The actual thrilla was nice and I liked the blinds and refined zoomer the most! If we are comparing demos here (and I think we are! ), I think Shape had the bigger and better bicep to flex at this particular occasion. After rewatching it two times i really really enjoy it by now! It even deserved to win! Has more effects than the second place, and some of them are really nice and hard to do! I guess i just haven´t been in the mood for another 80s-style-demo when i watched it the first two times! added on the 2017-02-22 01:13:38 by ɧ4ɾɗվ. Superb synch and coherent design. Really stylish production with that cliched eighties theme. The 3D cityscape is really appealing. This demo sets you in a good mood. Great demo, Flex rules with main part music, Tristesse remix also very nice. page created in 0.020521 seconds with 15 queries.